Devil’s® cucumber mayonnaise, a staple of the American kitchen, is now available for commercial kitchens. 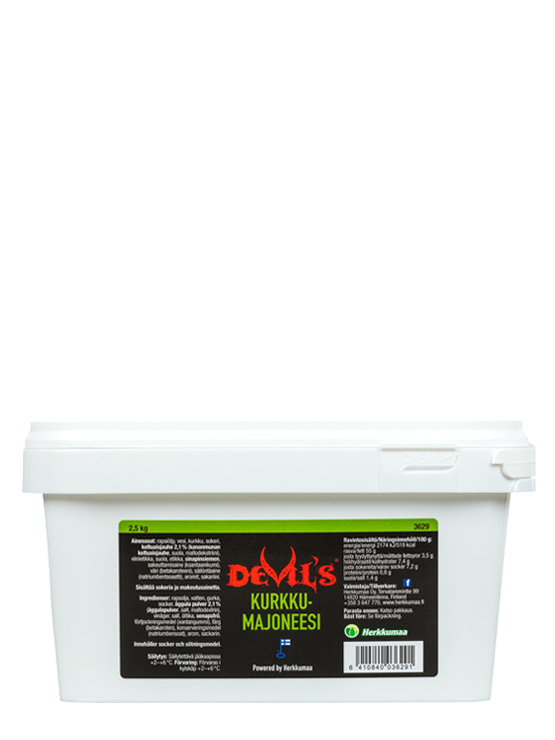 This cucumber mayonnaise is a combination of rich mayonnaise and Finnish cucumbers and can be used as a side sauce on a buffet table or with fast food at home, and it is also suitable for cooking with. The lactose-free and gluten-free mayonnaise is available in a 2.5 kg package. Ingredients Rapeseed oil, water, cucumber, sugar, egg yolk powder 2.1% (egg yolk powder, salt, maltodextrin), wine vinegar, salt, vinegar, mustard seeds, thickener (xanthan gum), colouring (beta-carotene), preservative (sodium benzoate), flavourings, saccharin. Contains sugar and sweetener.